Why participate in challenges? A theme, some parameters and a deadline can actually encourage creativity by narrowing focus. There are endless options for pattern and fabric combinations and it is so easy to build a stash of fabrics along with a stash of patterns. Sometimes I can just wallow in the stashes, unable to make a creative decision. For this group of Project Sewn Challenges, I really gave it some thought, even making notes, on actual paper. Going back and forth on decisions, digging through what I had, while keeping in mind the commitment to the Ready to Wear Fast. I needed wearable items to help get me through the summer season. Sticking to the themes narrowed my choices by process of elimination. The first challenge, Leading Lady, had me buying a new pattern and new fabric for my Grace Kelly inspiration. The second, Floral Frenzy, was stash fabric, stash pattern and a project I had started almost a year ago. Third up, Going Global, was another new pattern and new fabric. The final challenge of Signature Style is, appropriately, stash fabric and stash pattern. The fabric was purchased last summer on a trip to Montreal, a city with a European feel and a surprising number of fabric shops. I was almost out of energy, time and money when I spotted this Italian brocade through the open doorway of a store I almost passed up, the not so European sounding, Sam’s Textiles. It sat in the closet for almost a year, just waiting for fabric, pattern and motivation to all come together. 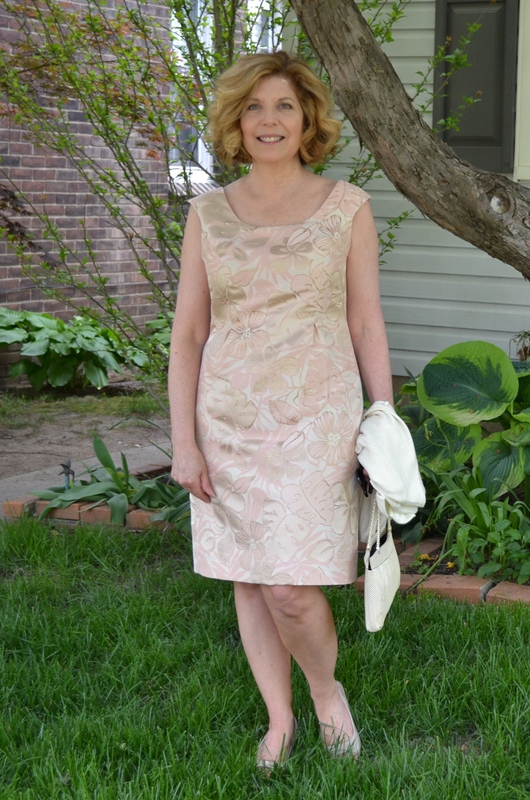 The pattern is from Butterick 5428, a lined sheath dress with princess seam darts, which create small pleats at the waist. I chose to make it sleeveless. 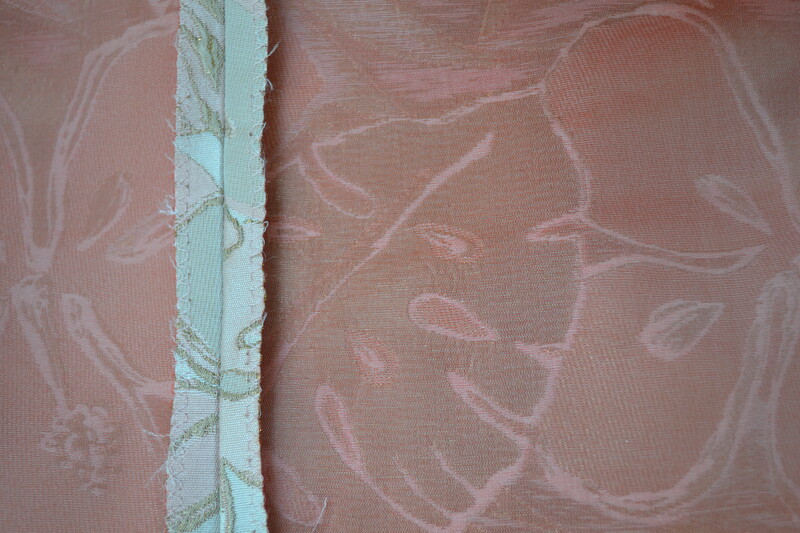 I used a peachy pink silk organza underlining, something I would have found too intimidating to do a few years ago. 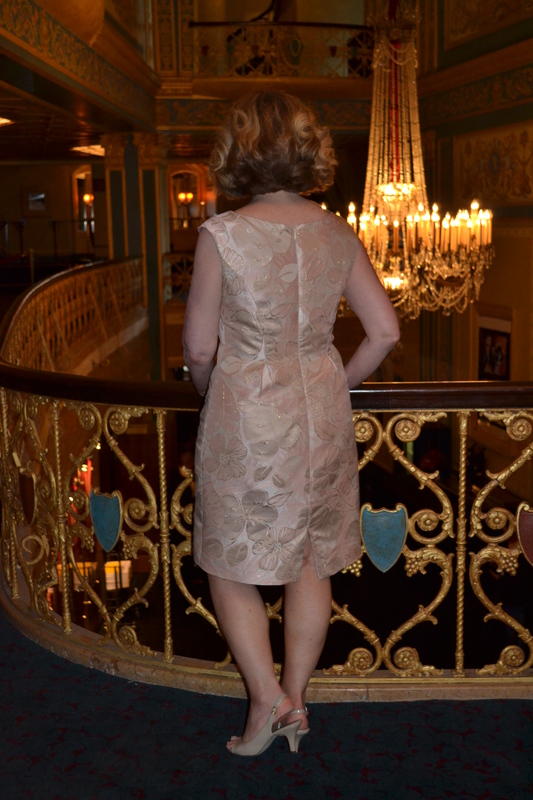 I took a class called the Little Sheath Dress with Helen Haughey at the American Sewing Expo two years ago and got past some unfounded fear. I’ve been sewing since I was a kid, but have learned more in the past 4 years than the previous 40. 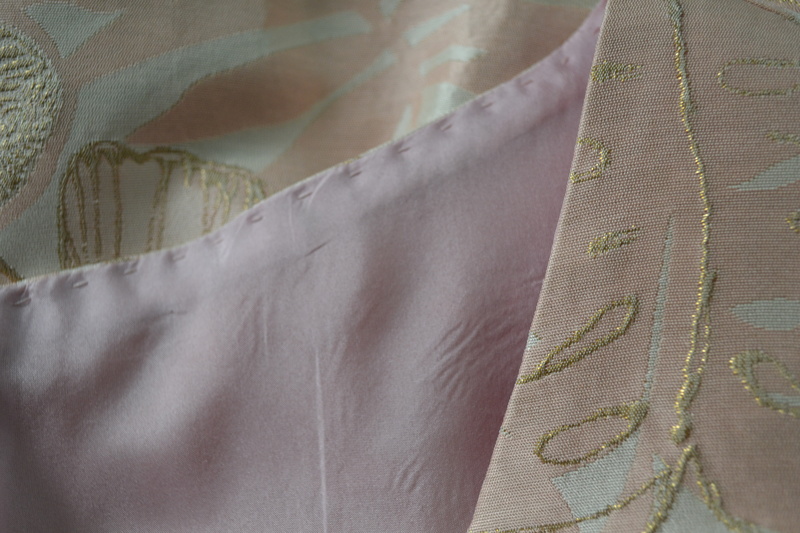 All the wonderful blogs, online classes and in person classes are inspiring and have really improved my sewing. 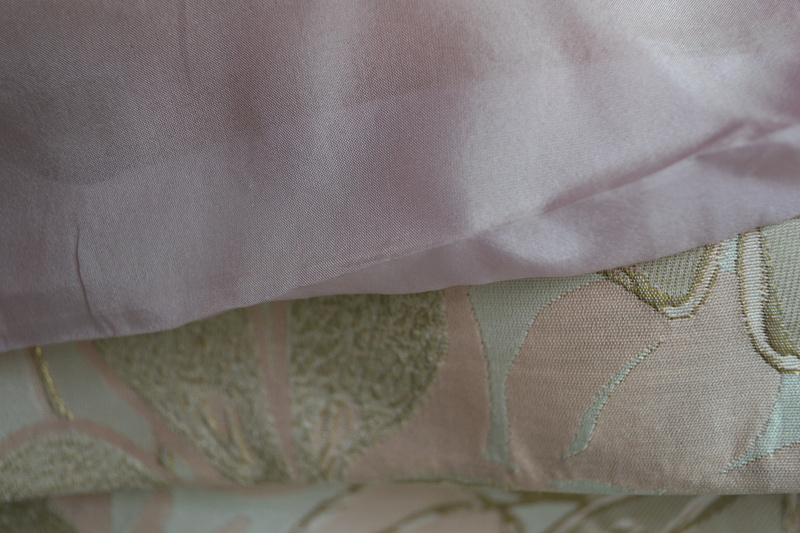 The lining is a pale pink China silk. I did a hand picked stitch for the understitching around the neckline and armscye. I also bagged the lining at the hem, for a clean finish inside. 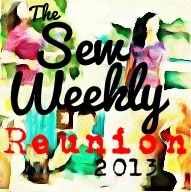 The motivation came not only from Project Sewn, but in needing a dress for an event. As a college academic adviser, the annual commencement ceremony is a working event. Any graduation ceremony has a team of people working behind the scenes to pull it off, but we are still celebrating the achievement of our students and everyone dresses a little nicer than normal. 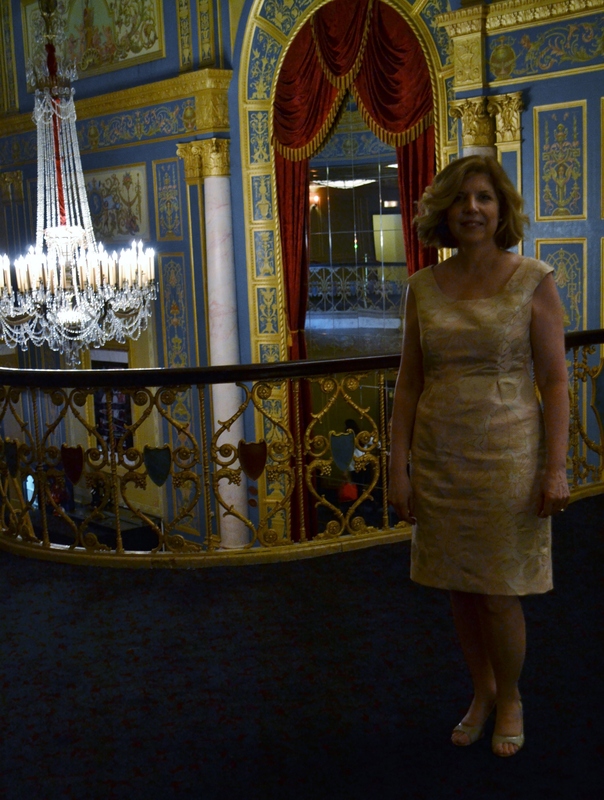 Our ceremony is held at the beautiful Detroit Opera House, which has an incredible historic interior. One of my coworkers was kind enough to snap a few pictures before the festivities started. The lighting is very low to help preserve the beautiful walls and my dress was a little rumpled from the rain and being at my desk for a few hours before heading to the Opera House. 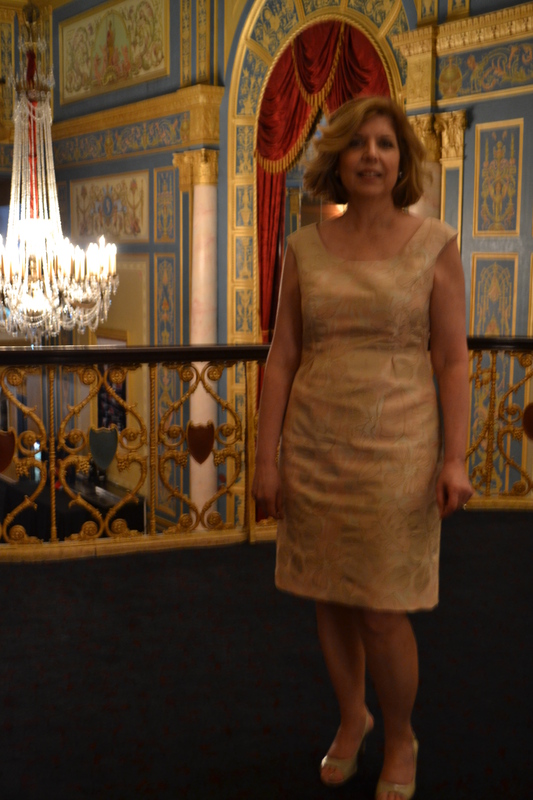 Fortunately I had another opportunity to wear it again a week later for a business celebration dinner with my husband. And very much like yours. We both seem to favor the sheath. Thank you. Yes, I think we do! Just sewing another, although I have just made my 4 th Anna dress (By Hand London) it is a firm favourite at the minute. I like the shape of it- fitted at the waist and then skimming the rear! 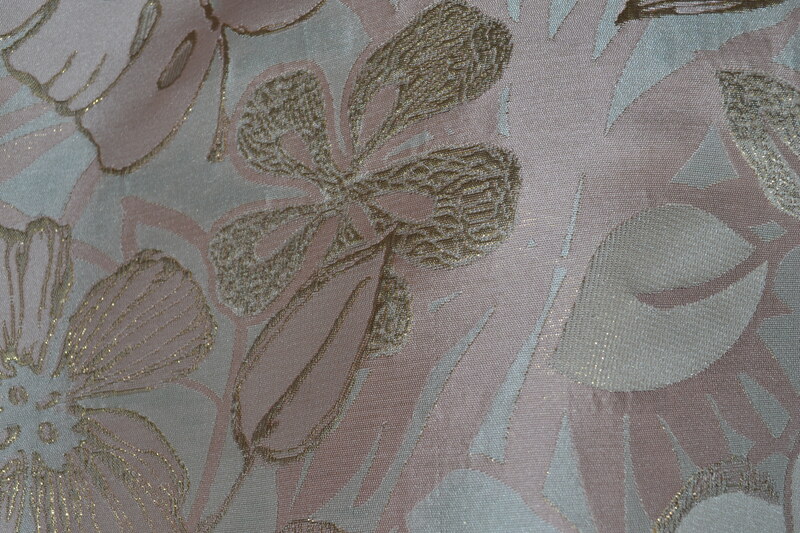 The fabric is very interesting! I like your choice of pattern, using simple lines to give justice to fabric. Thanks. Funny, I was just thinking I make simple things with patterned fabric and more complicated garments with plain fabric. Would it be possible to pull off a complicated garment with a patterned fabric? Or even multiple fabrics? It would be fun to play with. Such a beautiful dress! Your construction sounds (and looks!) meticulous, which I really admire. What gorgeous fabric! And I love your simple, elegant style. Lovely fabric and attention to construction details. It looks simple yet elegant.